By 10:00 a.m. on July 23, 2016, fishing has already begun on a ship owned by Fujian Shihai Fisheries Co., Ltd, a company headquartered in the Chinese city of Fuzhou. The ship is sailing far off the west coast of Africa in the maritime territory of Guinea Bissau. The ship’s captain, surnamed Xu, 63, left, and two local workers attempt to disentangle a net snared on a strut on the side of the ship. Xu is from Zhejiang province. He began working in the distant-water fishing industry in 1995. Jin, the 44-year-old Second Engineer, brushes his teeth on deck, July 22, 2016. Jin, who first came to work in Africa in 2008, is from Henan province. Captain Xu’s ship left port in Dakar, Senegal on July 20, 2016. Industrial fishing vessels like this one typically spend 20-30 days on the water at a stretch. On another ship owned by Fujian Shihai Fisheries Co., Ltd, First Mate Wang directs a local sailor drawing in a net, July 25, 2016. Wang’s ship has already been at sea for more than 20 days. It is now returning to a port in Dakar. According to a Chinese government report, in 2015 there were approximately 550 Chinese fishing vessels operating in African waters. 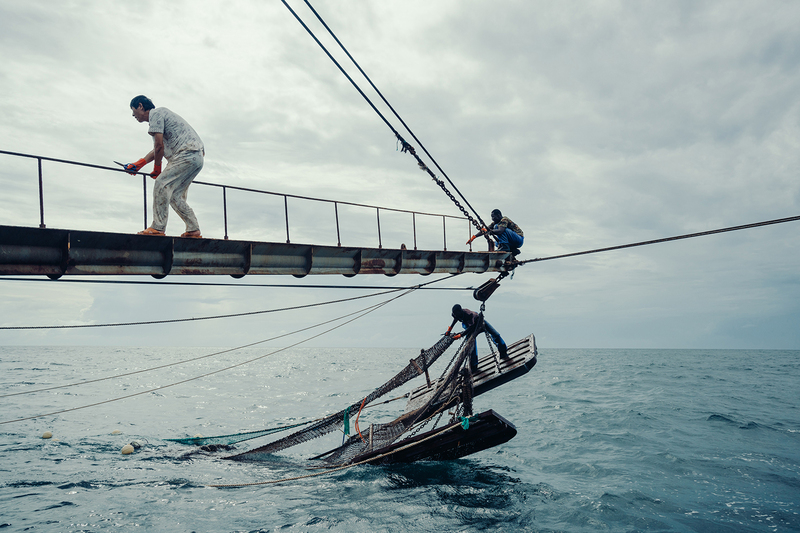 Crew members clean and sort the catch after the nets have been retrieved on Captain Xu’s ship, July 22, 2016. This process happens every two or three hours, 24 hours a day. 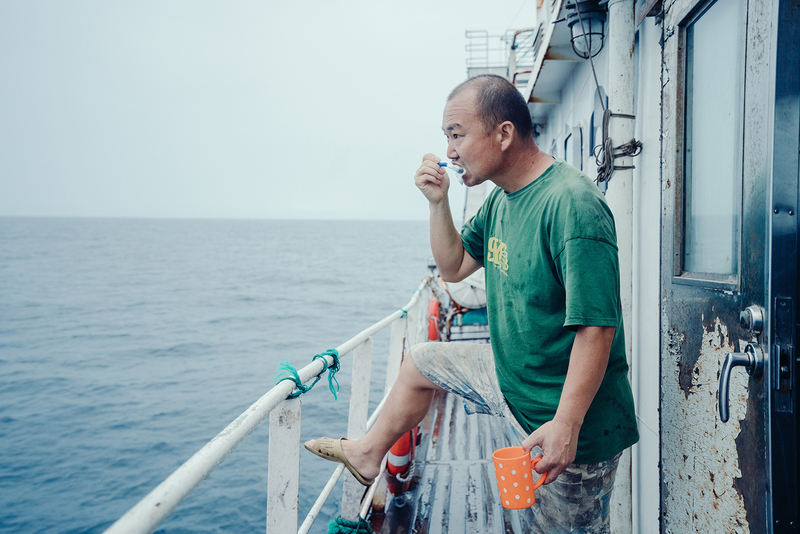 According to Xu, on a good day his crew can net up to 10,000 kg of fish, but on a bad day there might only be 4,000-5,000 kg. This trip’s catch has been on the lower end. A crewmember throws a guitarfish back into the water to die after cutting its fins, July 22, 2016. The guitarfish is part of the by-catch caught in the trawl net. Its flesh is not considered palatable, but there is demand for its fins in Chinese markets. 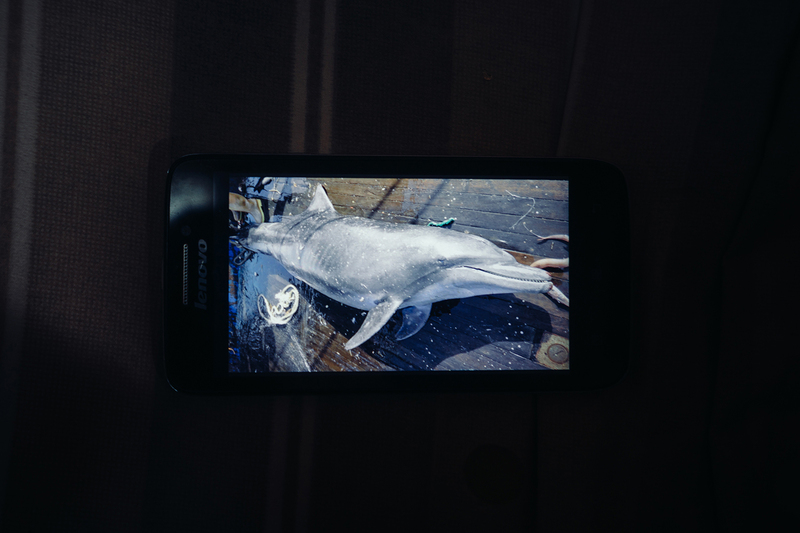 A worker on Wang’s ship displays a picture of a spinner dolphin (Stenella Longirostris, already dead in the photo) on his cellphone, July 25, 2016. The dolphins get caught in the trawl nets used by industrial fishing boats, which catch indiscriminately. Captain Xu shouts out orders to crewmembers from the deck, July 23, 2016. The Chinese workers’ salaries range from 6,500 renminbi (U.S.$943) per month to 25,000 renminbi (U.S.$3,630) per month, while the monthly salary of the local crewmembers is around 100,000 CFA Franc (U.S.$170)—a high salary for West African locals, according to interviews with some of them. 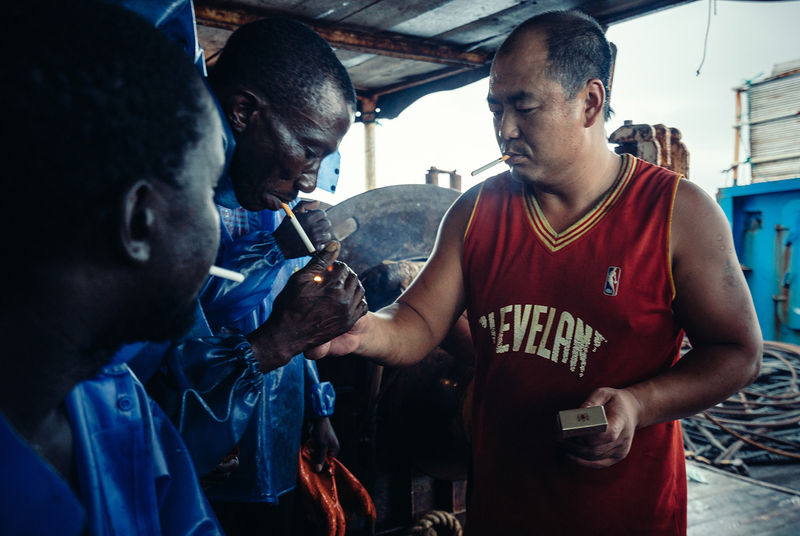 First Mate Wang passes cigarettes to a coworker on his ship, July 25, 2016. 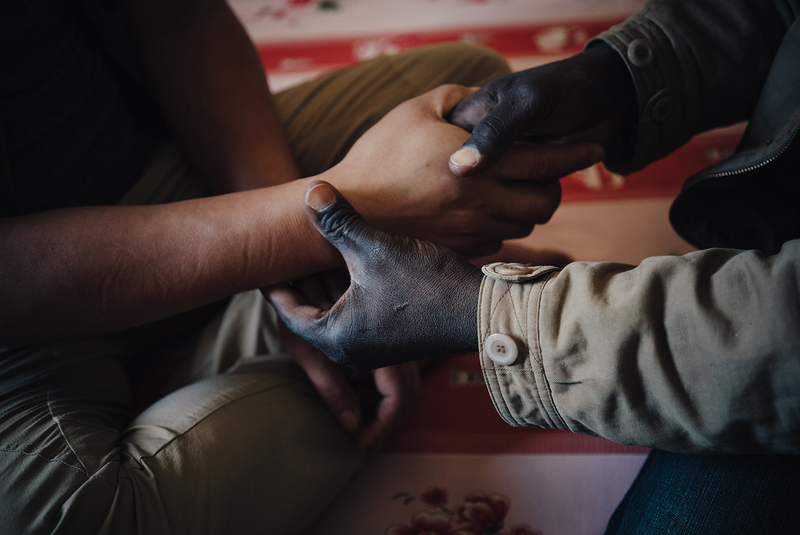 The African and Chinese crewmembers communicate through hand gestures and a handful of simple shared words and phrases. 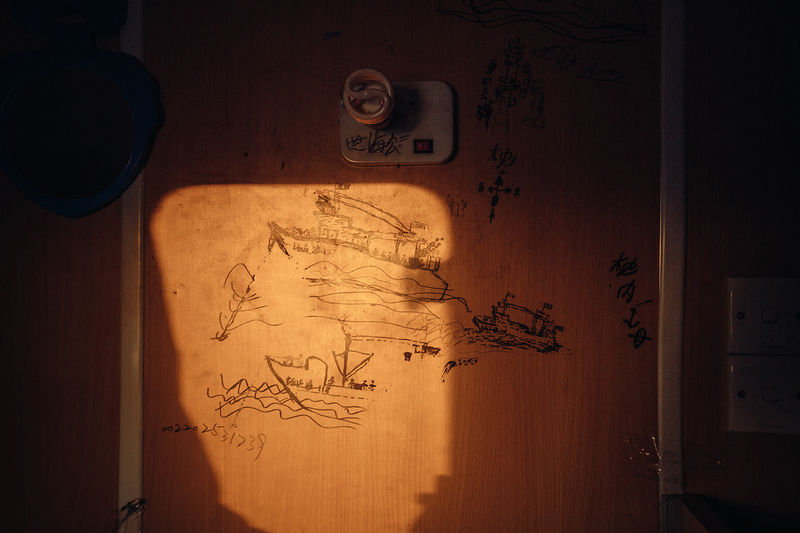 Jin reads a book on his cellphone in his cabin on Captain Xu’s ship, July 22, 2016. There is no signal when out on the water, and the narrow cabin contains no room for entertainment equipment. During his time off, Jin reads on his cellphone or sleeps. Local fishing methods operate on a much smaller scale than do Chinese industrial vessels. 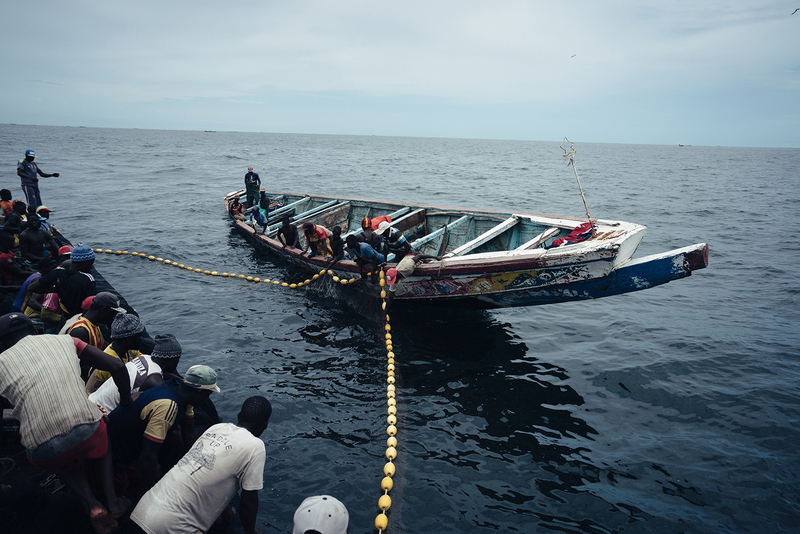 In Senegalese naval territory, a local fishing crew waits to draw in a net strung between two boats, July 15, 2016. 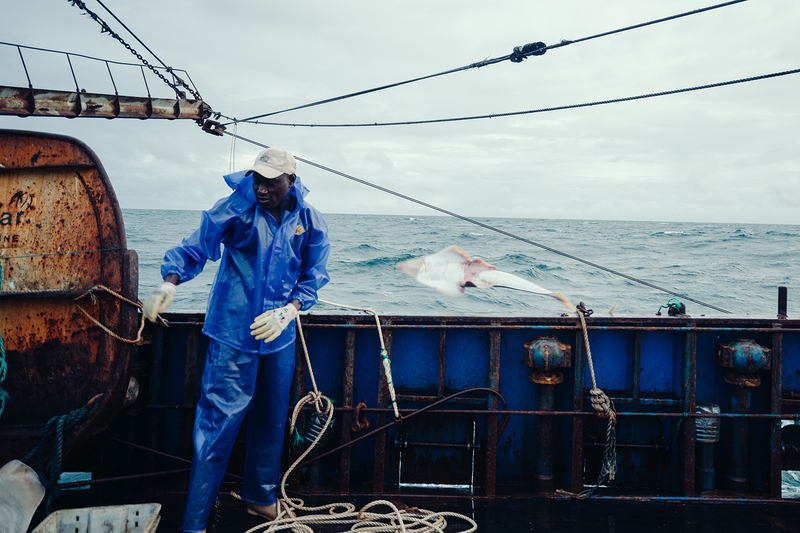 Fishing and associated employment is a major source of jobs in Senegal, as well as a critical part of the economy. The crew hauls in a midday catch, July 15, 2016. Besides a GPS unit, the boat carries no modern electronic fishing equipment. 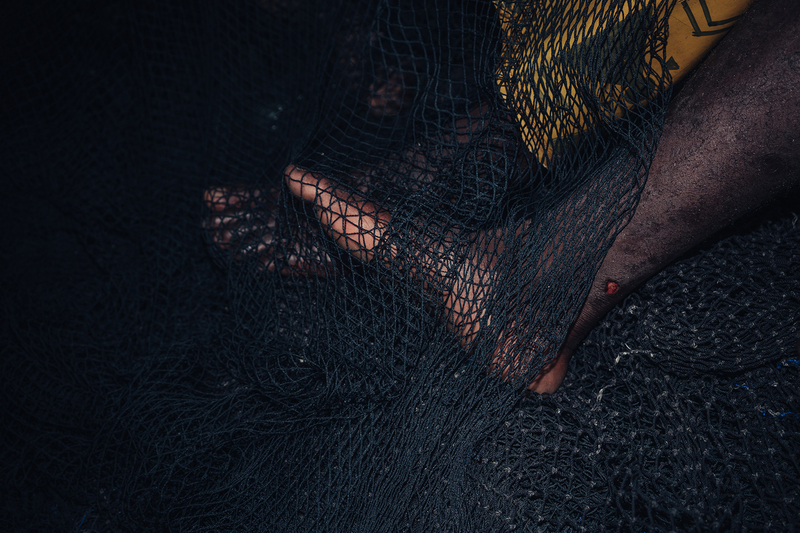 A fisherman rests his injured foot during a break from work, July 15, 2016. Commercial fishing is consistently ranked one of the world’s most dangerous professions; on-water safety incidents include collisions, mechanical failure, drowning, and sinking. 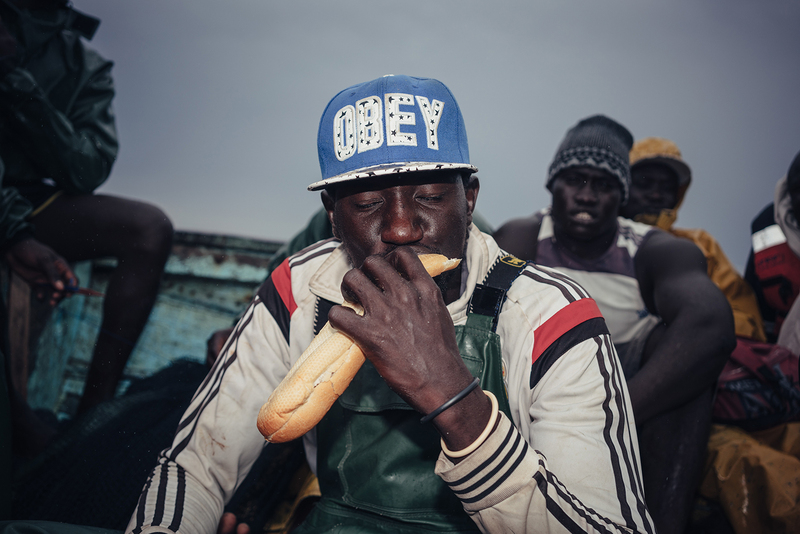 Youssou Diouf, 38, captain of a local fishing ship from Joal-Fadiouth, Senegal, eats a baguette during a break, July 15, 2016. The fishermen’s diet while at sea consists almost exclusively of bread and roasted fish. 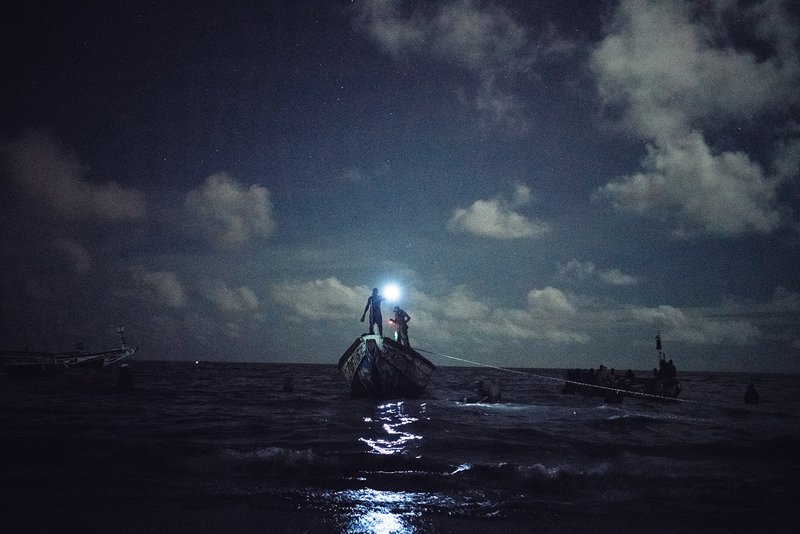 Just after midnight, Diouf and his crew finish a day’s work at sea and have come in to shore in Joal-Fadiouth, Senegal, southeast of Dakar, July 15, 2016. 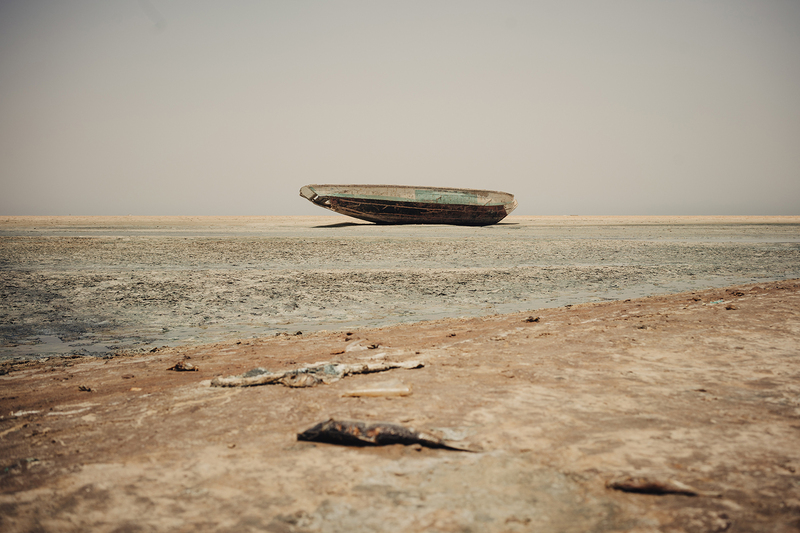 According to Diouf, they used to be able to fish from the shore, but in recent years, they have to venture farther out to sea, sometimes as much as 25 miles, to find enough fish. 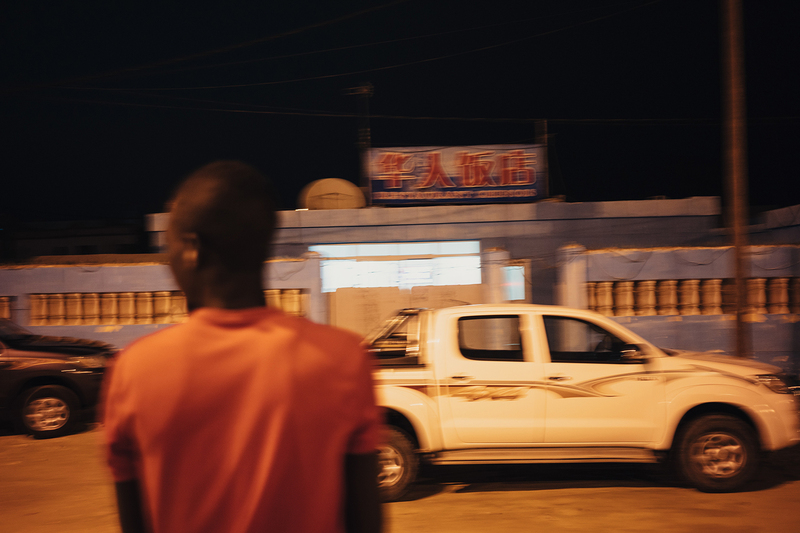 Employees of the China National Fisheries Corporation (CNFC) arrive in their cars at a Chinese restaurant in Nouadhibou, Mauritania, June 23, 2016. CNFC is one of the leading companies of China’s distant-water fishing industry. 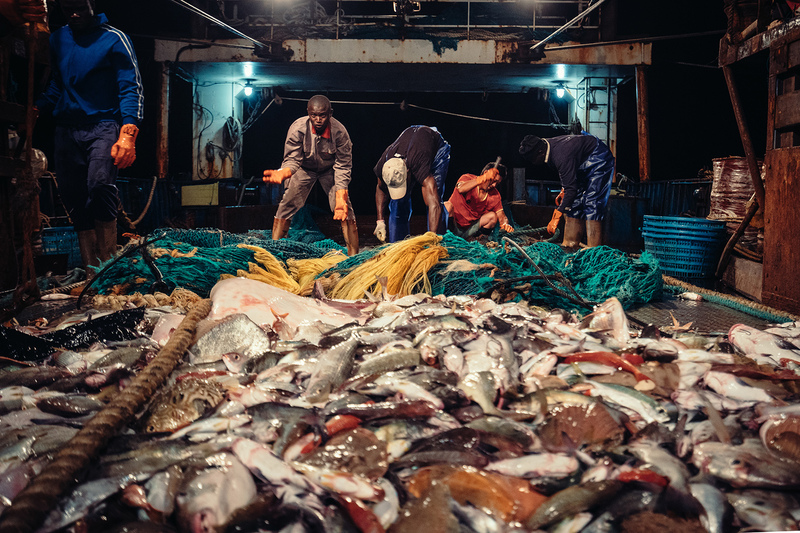 In 1985, CNFC came to West Africa to enter the distant-water fishing industry and currently has business in Senegal, Mauritania, Guinea, and Guinea-Bissau, as well as elsewhere across the Pacific, Atlantic, and Indian Oceans. Local workers trim fish, mostly Sardines, at the Lem Seafood fishmeal factory, in Nouadhibou, Mauritania, July 1, 2016. Sardines are ideal for making fishmeal. 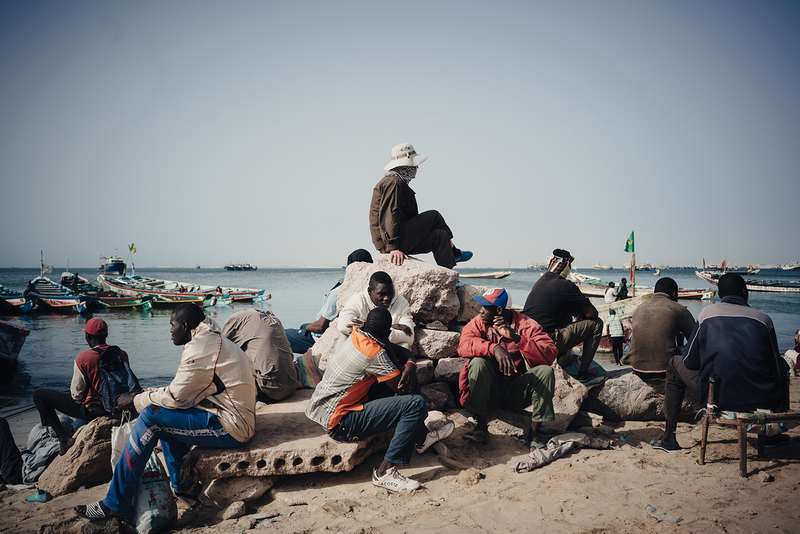 Mauritanian waters contain abundant sardine stocks, but locals don’t eat much fish, making it an ideal location for Chinese to operate a fishmeal factory. At the seaside industrial park where Lem Seafood is located, there are around 20 fishmeal factories of varying sizes, half of which have Chinese owners. Liu Zhaoquan, 60, the supervisor at Lem Seafood, eats at the factory cafeteria, June 29, 2016. Liu comes from Shandong province. He formerly worked as a carpenter. In 2011, he came to Nouadhibou to help his nephew oversee the fishmeal factory. He goes back to China once every two years. The factory provides Chinese employees Shandong-style dishes, one of the few reminders of home, Liu says. A local employee talks with the owner of Lem Seafood fishmeal factory, June 28, 2016. Local employees say they are happy to work for Chinese bosses, who they describe as industrious, smart, and wealthy. But, they also report having heard of attacks on Chinese nationals. With the end of Ramadan approaching, Mrs. Zhang, a finance employee and cook at Lem Seafood, hands out workers’ wages early, June 29, 2016. Local workers are paid around 50,000 Mauritanian Ouguiyas (U.S.$139) every month, which workers say is a good salary. In the morning, Liu, in a white hat, oversees the transfer of fish from boats to trucks on the shore, June 29, 2016. 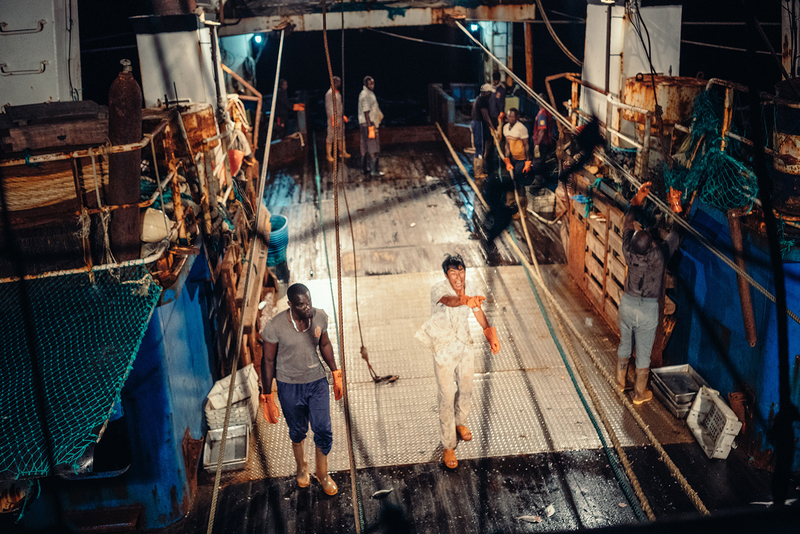 On average, the factory goes through 200 tons of fresh fish per day, mainly supplied by Senegalese and Mauritanian boats. 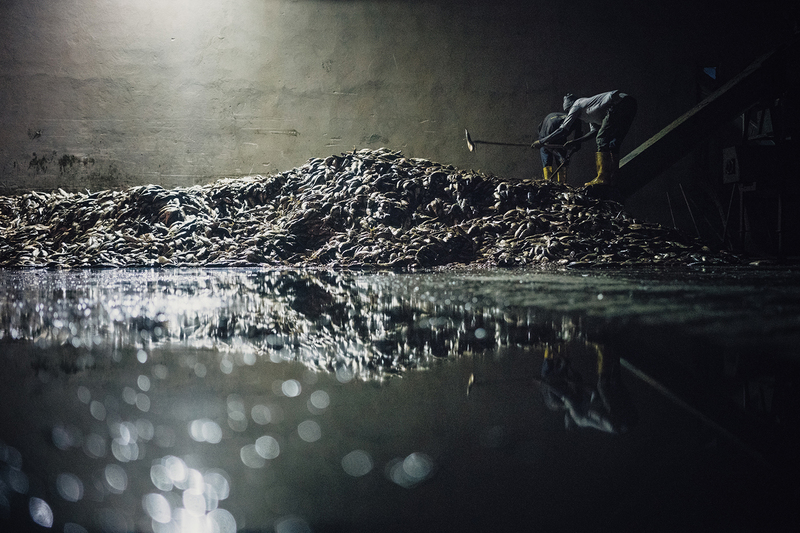 But, as the number of fishmeal factories has increased, demand often exceeds supply and some Chinese factories have started to form their own fishing fleets. The beach near Lem Seafood fishmeal factory has become a squalid mess of debris and a stench from the wastewater released by factories like Lem Seafood permeates the air, June 30, 2016. 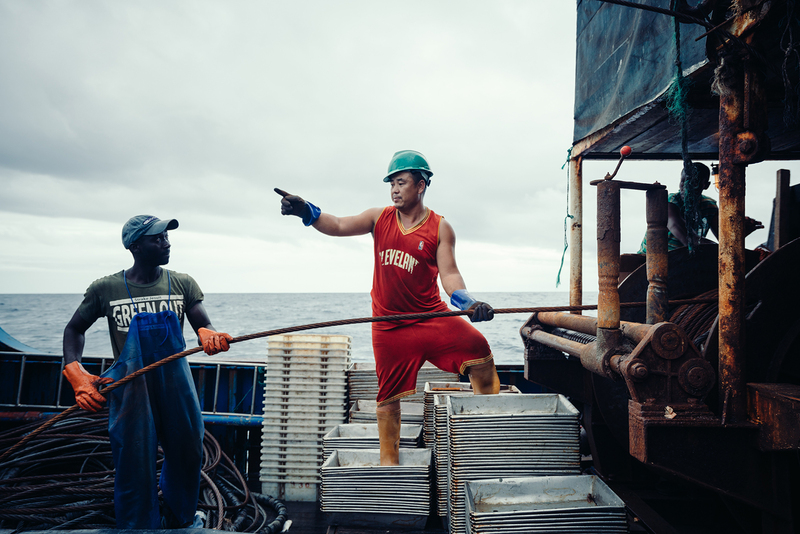 In recent years, the Mauritanian government has welcomed Chinese investment in the fishing industry. But according to fish-product factory employees, management is lax. 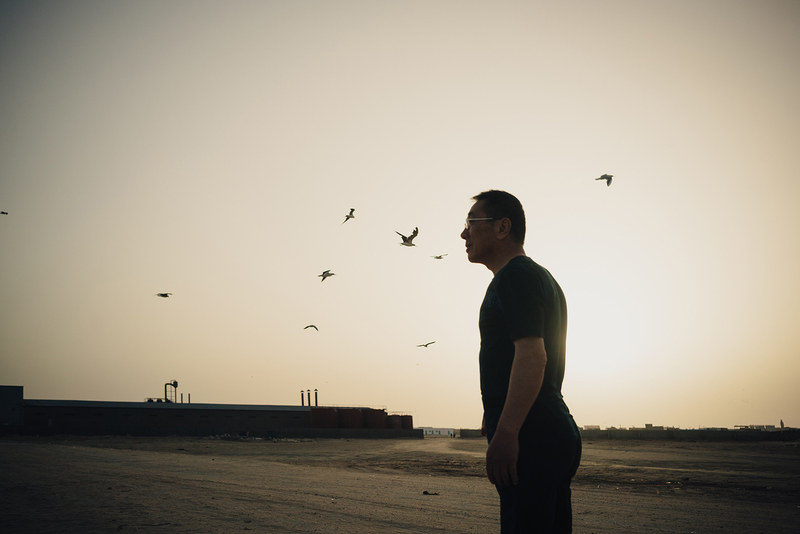 Liu looks out over the beach outside Lem Seafood fishmeal factory, July 5, 2016. Countries across Africa are using their bountiful natural resources, favorable government policies, and low labor costs to attract more and more Chinese investors, like Liu. 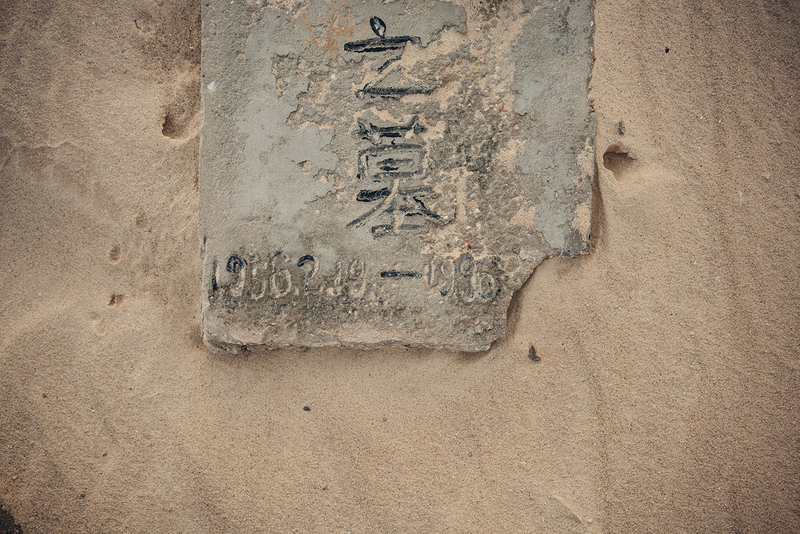 A gravestone in a Chinese cemetery near the ocean in suburban Nouadhibou, July 4, 2016. Most of those buried here were involved in the distant-water fishing industry. Their graves are largely left unattended, except during the Chinese Tomb Sweeping Festival, according to the Chinese people who live here. Painted fishing boats are seen on the walls of Captain Xu’s cabin, July 23, 2016. No one knows who painted them. When photographers look for images to capture the effects of China’s nearly three-decade-long economic boom, most often they point their lenses toward the sky. Soaring cities of glass and steel may be the perfect visual shorthand for China’s ambitions, but China’s changing fortunes are just as visible closer to the ground, on the nation’s tables and plates. 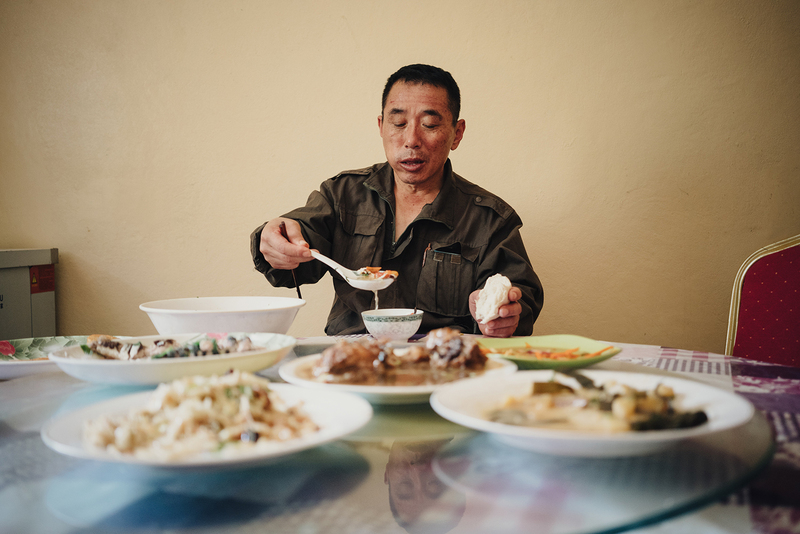 In the early 1980s, as the country was just emerging from the privation of its years under Mao, an average Chinese person consumed less than 10 grams of animal protein a day—or roughly a single ounce of meat or fish. Over the past three decades, as the country has grown wealthier and more urban, that number has grown more than tenfold, according to research from the Center for Strategic and International Studies’ China Power Project. The country’s appetites, combined with chronic shortages of land and water, as well as severe pollution, mean China has had to turn outward to keep its butchers and fishmongers supplied. The teeming waters off the coast of West Africa have been a key target in a government-subsidized and rapidly expanding foray into the industry known as “distant water fishing.” Chinese companies now captain a flotilla of nearly 3,000 industrial fishing vessels in international waters, the majority in the oceans off of Senegal, Gambia, and Guinea Bissau. While, for the moment, these boats keep Chinese diners well supplied, the industry is poorly regulated and both environmental experts and local and Chinese fishermen say it has severely depleted the region’s once rich fisheries, pushing them, as Andrew Jacobs wrote recently for The New York Times, to the brink. 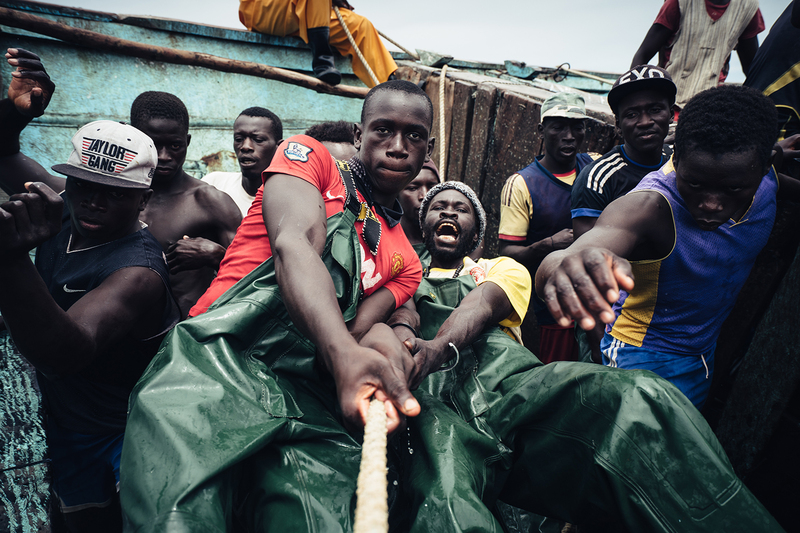 Frequent ChinaFile contributor Yuyang Liu traveled to Senegal and Guinea Bissau with Greenpeace to photograph crews on the vessels plying their waters, and the way they are changing life back on land.